The twentieth century has been dubbed as the ‘American century’ and America’s presence in Southeast Asia is well known: From the conquest of the Philippines to America’s role in the Pacific theater during World War Two to America’s even more visible and lasting role in Southeast Asia throughout the Cold War. Less is known about America’s earlier presence in Southeast Asia in the 19th century, when the new republic was attempting to make contact with the polities of Southeast Asia, and when American foreign policy was tempered by its profession of neutrality and its isolationist posture. 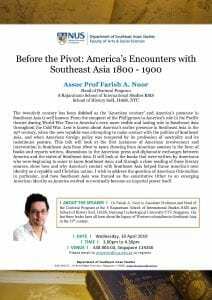 This talk will look at the first instances of American involvement and intervention in Southeast Asia from 1800 to 1900, drawing from American sources in the form of books and reports written, discussions in the American press and diplomatic exchanges between America and the states of Southeast Asia. It will look at the books that were written by Americans who were beginning to come to know Southeast Asia; and through a close reading of these literary sources, show how and why America’s contact with Southeast Asia helped frame America’s own identity as a republic and Christian nation. I wish to address the question of American Orientalism in particular, and how Southeast Asia was framed as the constitutive Other to an emerging American identity as America evolved to eventually become an imperial power itself. Dr Farish A. Noor is Associate Professor and Head of the Doctoral Program at the S Rajaratnam School of International Studies RSIS and School of History SoH, HASS, Nanyang Technological University NTU Singapore. His last three books have all been about the legacy of Western colonialism in Southeast Asia in the 19th century.